There are two basic categories of life insurance: term and various forms of cash value life insurance. Today, I am going to talk about term life insurance and ways to use it more creatively to not only obtain a more appropriate amount of long-term protection, but also to save money. Term life insurance is simple. You pay a fixed annual premium in return for a promised amount of protection from the life insurance company during the term of the policy. The face value of the policy is paid to the named beneficiaries only if the insured person dies during the specified period. So, term life insurance is similar to homeowners insurance in that if nothing happens (during the term), you continue to pay the premium, and if something happens, the insurance company pays the claim. Term life insurance policies are generally quite affordable because most people buy and hold them during periods of youth (say under age 60). Therefore, since the risks are lower, the costs are lower. 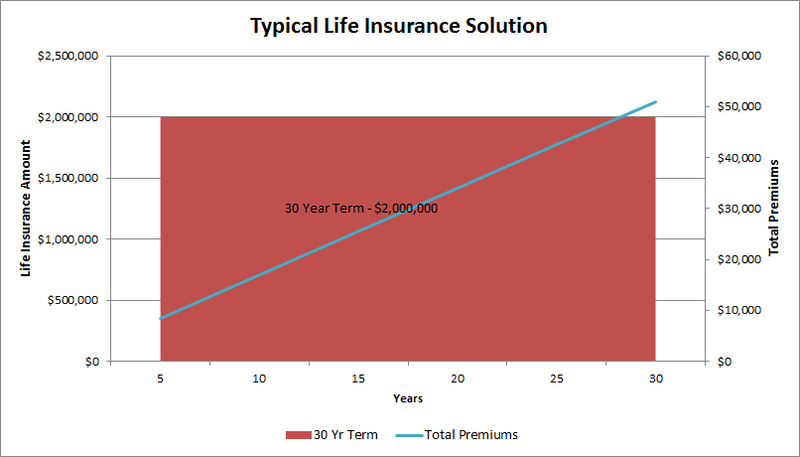 Naturally, if you are 30 years old and buy a $1million 5-year term life insurance policy, the annual premium will be lower than if you were to buy a $1 million 10-year term life insurance policy since younger ages are covered during the period. Another important aspect about life insurance need is that it declines as you age. This makes intuitive sense because insurance is designed to provide instant wealth needed to replace the lost future income, or to cover future expenses that the insured’s income won’t be able to cover. The younger you are, the more insurance you would need to replace future lost income. However, as you age and begin to build wealth, the less need there is for life insurance. Like the example at the very top of this page, a hypothetical client is 30 years old and is married with two children. He is concerned about his mortgage, retirement funding, and his kids college costs. Therefore, we determine that he needs $2 million of coverage. 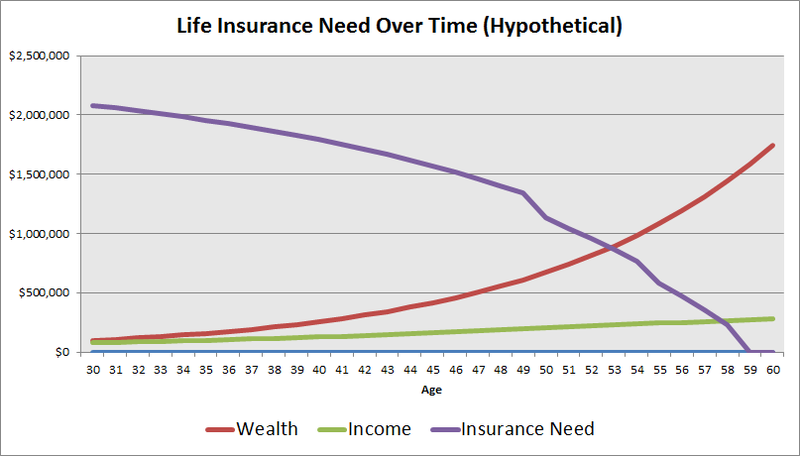 The typical solution (illustrated in the graph immediatly above) would be to purchase a $2 million 30-year term life insurance policy. This would cost $1,700/year and these premiums would amount to a total of $51,000 over this 30-year time period. However, if instead the advisor matches this client’s long-term need (which declines) with a layering of different length policies over the next 30 years, the client can obtain more appropriate protection at a lower costs. As shown in the chart below, this client is able to buy three term policies. The first (in red) is a $500,000 30-year term policy costing $500/year. The second (in green) is a $500,000 20-year term policy costing $265/year. The last (in purple) is a $1,000,000 15-year policy costing $390/year. As you can see, the total premiums for the client who layers his term life insurance would only total $26,150 versus the first client who did not layer his term and paid total insurance premiums of $51,000. Also, you can see how his insurance benefits begin at $2 million and drop to $500,000 over time, more closely mimicking his need (as illustrated on the chart on the first page). Since the first client became over-insured over time, his beneficiaries are actually better off (economically speaking of course) with him dead. When that happens, you have too much life insurance! 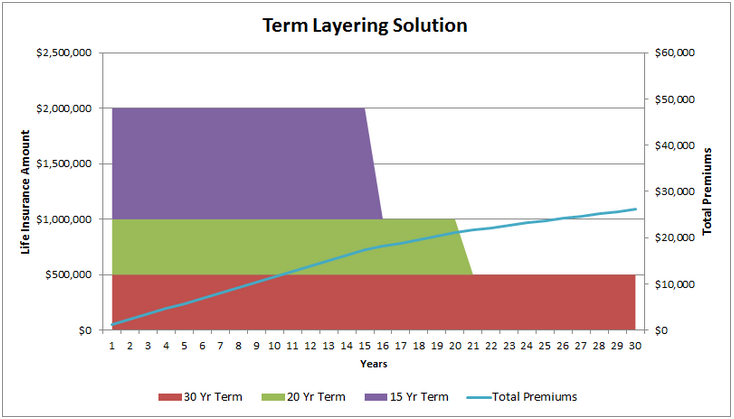 Consider layering your term life insurance in order to protect your loved ones more appropriately and inexpensively!